Johannes Brahms’ Violin Concerto in D major, Op. 77 stands with Beethoven’s Concerto at the pinnacle of the violin repertoire. No concerto unleashes the soaring, heroic power and poetic potential of the violin more profoundly than Brahms’. It’s music that runs the gamut between smoldering ferocity and tranquil introspection, encompassing a universe of expression. Joachim plays my piece more beautifully with every rehearsal, and his Cadenza has become so beautiful by concert time that the public applauded into my Coda. As a composer, Brahms was haunted by the “footsteps of a giant,” Beethoven, whose music had profoundly changed the course of music history. Following the example of the Beethoven Violin Concerto, Brahms’ Concerto is set in D major and opens with a long orchestral introduction. From the opening of the first movement, there’s a sense that the music is searching for a way forward. Following the opening statement, the oboe takes us in a new, unexpected direction. Then, resolute octaves turn into chords and suddenly we know where we are. In the passage that follows, listen closely to the canon that develops between the high and low strings. The first movement’s introduction concludes with a ferocious buildup to the violin’s entrance. Notice the rhythmic instability Brahms sets up in the low instruments, which causes us to lose track of the downbeat. You’ll hear Brahms play these occasional rhythmic games throughout the movement, especially in the final bars. One of this concerto’s most serenely beautiful moments is the first movement’s coda, following the cadenza. In these bars, time seems suspended and we almost hold our breath as the final tutti is delayed. Just when we think the violin can’t reach higher, it somehow does. As the movement inches towards its final resolution, listen to the quiet, suspended fanfare in the horns and woodwinds. The final movement is a sparkling, fun-loving romp. You can hear echoes of the final movement of Max Bruch’s First Violin Concerto. Brahms’ opening theme apparently served as a model for Andrew Lloyd Webber’s pop song, Don’t Cry for me, Argentina from the musical, Evita. 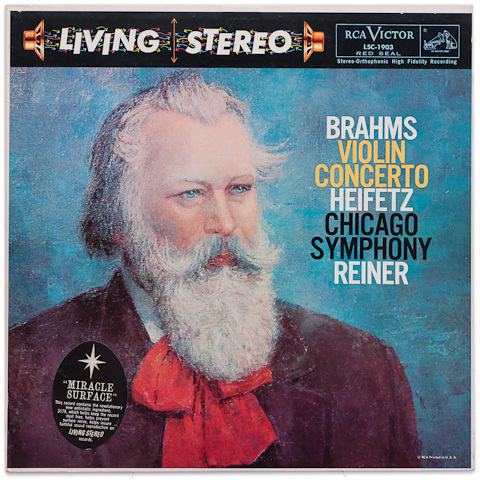 Here are eight contrasting recordings of the Brahms Violin Concerto. Explore the list and then share your thoughts in the comment thread below. If you have a favorite recording that didn’t make the list, leave your own suggestion below. If you’re looking for a modern performance, you won’t go wrong with Hilary Hahn’s 2001 recording with Sir Neville Marriner and the Academy of St. Martin in the Fields. The motto of this CD might be, “opposites attract,” because the Brahms is coupled with an equally great performance of the Stravinsky Violin Concerto. In his book, Great Masters of the Violin, Boris Schwarz recounts that someone overheard Brahms promise to write a short violin fantasy for the young Huberman, adding jokingly, “if I have any fantasy left.” But Brahms died the following year. Julia Fischer’s 2006 recording with conductor Yakov Kreizberg is the most recent CD on the list. Fischer offers a Romantic and introspective reading, filled with mystery. The disk includes Brahms’ “Double” Concerto with German cellist Daniel Müller-Schott. Anne-Sophie Mutter recorded the Brahms early in her career with Herbert von Karajan and the Berlin Philharmonic (listen here). It’s interesting to compare that more straightforward interpretation with her later 1997 recording with Kurt Masur and the New York Philharmonic. The later recording is definitely more romantic with more emphasis on vibrato. Mutter’s dynamic range is also remarkably wide. I’d be interested in hearing your thoughts on which version you prefer. Few “great recordings” lists are complete without a performance by David Oistrakh. Oistrakh recorded the Brahms Concerto several times. Otto Klemperer conducted this reverberant 1960 studio recording. This 1991 Ruggiero Ricci CD features sixteen cadenzas including those written by Ferruccio Busoni, Leopold Auer, Eugène Ysaÿe, Fritz Kreisler, Adolf Busch, and Nathan Milstein. Excellent sampling of the Brahms violin concerto recordings with a mix of the mid century masters and new, younger artists. One other I might include is the often forgotten, due to his early death, is Michael Rabin’s recording of the Brahms, not to mention many other fine recordings. I have david Oistrakh’s performance on 10 1/2 inch 15 ips two track Master Tape, and it is gorgeous. Thanks so much for compiling these recordings in one place. I was impressed by your writing. The article was educational and a delight to read. Combined with your musical talents, you are obviously quite the artist. When I was 10 years old, I was fortunate enough to be in a repertoire class with Anastasia Jempelis at the Intermountain Suzuki Institute. Her energy was astounding! Good luck with your many pursuits, and thanks, again, for the article. Thank you for your kind words, Mike! My first exposure to this Brahms was a tv performance. I believe is was by berliner philharmoniker in late 70s or early 80s, by menuhin. I’ve forgotten who is the composer. I believe there is no cd recording of it. Very powerful strokes by menuhin. Henryk’s performance somehow reminded me of that tv performance. I’ve recorded it to a vhs and cassette. I lost both. Another great Brahms Concerto. Thank you for sharing this performance, Nick. Thank you for your work in assembling all these renditions – they are marvelous! In my father’s collection, I came across a burned CD of this Brahms concerto, but I do not know who the artist is. I listened carefully to each of these recordings you have here, but none of them is the one I have. The tempo is noticeably faster than most, but not quite as fast as Heifetz. The Huberman tempo seems just about right, but it definitely is not him. Ideas? I would love to know whose talents I am enjoying! It sounds as if you might have an old recording, Dena, but it’s hard to say who it might be. Keep listening and let us know if you discover the soloist. Found it! It is Nathan Milstein. Definitely my favorite, but I would love to hear what you think of his recording. It doesn’t get any better than Milstein. Thank you for adding this, Dena! “I have heard, all of your 8 favorite recordings of the Brahms. Like you, I’m very partial to the Heifitz recording. I’ve also been a long-time fan of Oistrakh, though of his recordings of the major concertos, I actually prefer his read of Beethoven Concerto. One that I would add to your list is Leonid Kogan/Kiril Kondarashin from about 1960. There’s an excitement in Kogan’s playing of this that I have always found appealing. To my ear, Kogan and Kondarashin had worked on the concerto, particularly the finale, for a long time, likely with many performances in concert and several “takes” in the recording studio. It is clear from the recording that these musicians knew one another well, enjoyed one another’s company and were both enthusiastic about this piece. I always hesitate to say that a recording is the best, but I do feel there are two violin recordings that tower above all. The first is Milstein/Fistoulari/Philharmonia for Brahms Concerto and the second is Szeryng’s first Bach sonatas and partitas set on Columbia. IMHO the reason these two surpass all others is the quality and uniqueness of tone the violinist makes in each recording. Milstein’s recording is every bit as exciting as that of Heifetz, but the beauty and individuality of sound Milstein makes is beyond human. Same goes for Szeryng and his Bach on tone – matchless beauty and distinctiveness. The Heifetz/ Reiner seems cold and dry to me by comparison. Nathan Milstein w Steinberg cond Pittsburgh on EMI is top of my list. Ardent, romantic, celebratory. It feels like a gauntlet of tragedy to reach the glorious celebration of the finale. passion galore and all of the technique of the later studio recording but with a more firm & sympathetic accompaniment from the orchestra. Efrem Zimbalist, a radio broadcast on Doremi, w Koussevitzsky cond Boston SO. The man just takes his time carving the lyrical lines while keeping perspective on the whole sentence. Adolf Busch’s brilliant 1943 performance w Steinberg cond NYP. 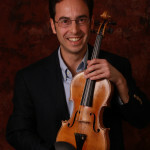 There’s an Isaac Stern I heard ages ago that I really admired but dont remember which it was. Thank you for posting these recommendations. I’m eager to check the Fischer out especially! Ooops! Milstein/ Fistoulari/ Philharmonia is top of my list. I have an EMI cd that couples it with the most amazing Milstein/Steinberg/Pittsburgh Tchaikovsky concerto. Just discovered this site – thanks for compiling it: a great service to music-lovers. As an anecdote, I recall being taken to a concert at the Royal Albert Hall (in 1958, or possibly 1959) where Menuhin and Oistrakh played the Bach Double Concerto and then Oistrakh played the Beethoven with Menuhin conducting, followed by Menuhin playing the Brahms with Oistrakh as conductor. One of the great musical experiences of my life, despite the Hall’s ropy acoustics. Thank you for sharing your memory of Menuhin and Oistrakh, Michael. Welcome, and I’m glad you’re enjoying The Listeners’ Club!